The Graduate Workers of Columbia led a protest on Low steps Thursday following Columbia's refusal to bargain. The graduate student union plans to file a charge accusing Columbia of violating federal labor laws for its refusal to bargain, union members said at a protest on Thursday. An email from Provost John Coatsworth on Tuesday announced that the University would wait until the status of graduate student workers was reviewed by a federal appellate court before it would consider further action, again delaying the legal process for what experts believe could take months. The University has long expressed its disagreement with the 2016 decision by the National Labor Relations Board to acknowledge the right of graduate students to unionize, which would grant students the ability to seek improved benefits and increased pay. 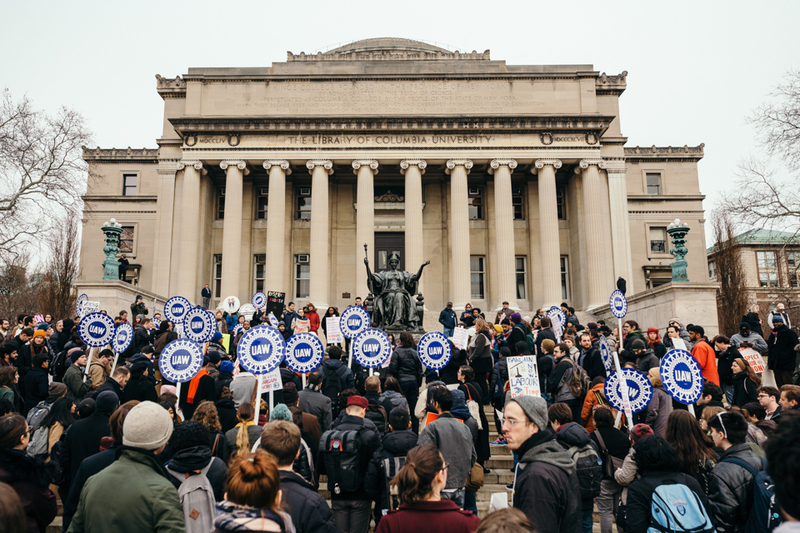 In response to a vote by graduate students to join the Graduate Workers of Columbia-United Auto Workers in December of 2016, the University has filed a series of objections that were ultimately rejected by the NLRB. In the union’s latest effort to gain recognition from the University, demonstrators gathered in front of Low Library to protest the decision and demand that Columbia initiate bargaining immediately. The protesters asserted that the actions taken by Columbia were not just wrong but illegal, urging cooperation between graduate students and United Auto Workers Local 2110 and Local 1199 of the Service Employees International Union. Key speakers included Maida Rosenstein, president of Local 2110, and Mike Ashby, vice president of SEIU Local 1199, which represents Columbia’s medical assistants. The City University of New York students and Columbia University Medical Center medical assistants also rallied in front of Low in solidarity with the GWC. Protesters held up posters and signs, calling not only for students but for communities in upper Manhattan to stand up against the University and to protect the right to unionize. In a speech to the demonstrators, Ashby said that the University’s actions contradicted its reputation. However, despite concerns over the University’s actions and the Trump administration’s ability to sway NLRB votes by appointing new conservative commissioners, both Ashby and Rosenstein said they remain optimistic as long as workers remain united. “I know that if all the workers on this campus stand together–graduate workers, 1199, clerical workers, office workers, janitors, dining hall staff–if we stand together, we will win,” Rosenstein said in her speech, invoking a chant of “We will win” from the crowd. According to union spokesperson Olga Brudastova, it is up to the Union to take further legal steps. After the Union files a complaint with the NLRB, the University can appeal the NLRB’s judgement in federal appellate court. Brudastova said she is not deterred by the University’s intention to take further legal action.